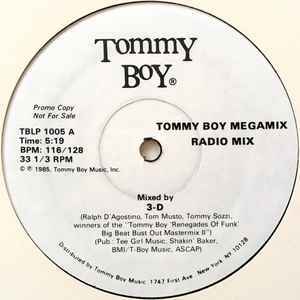 Winners of the "Tommy Boy Renegades Of Funk Big Beat Bust Out Mastermix II"
This version is the Sound Makers pressing plant variation and can be differentiated by the label typesetting and by the runout groove etchings. Matrix / Runout (A-side runout etching): TBLP-1005-SIDe A ✩PRESSED AT SOUND MAKERS,✩N.J. Matrix / Runout (B-side runout etching): TBLP-1005-PROMO "3D" ✩PRESSED AT SOUND MAKERS,✩N.J.